Anyone who’s come to Edisto for vacations year after year is bound to have things happen in day to day life that calls Edisto to mind. One of my triggers is crab legs. 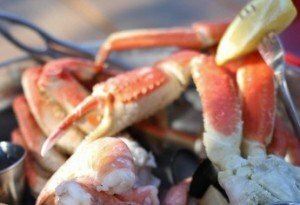 My love affair with crab legs started as a toddler playing in the swamp mud as my dad and older siblings caught crabs in Store Creek off Highway 174. As soon as I got old enough to help out, I was knee deep in the marsh water tossing my bait out there hoping to catch a blue crab. I didn’t just catch the crabs, either. I learned how to crack them open and clean out all the inedible gunk inside. Once they were all cleaned up and ready to be eaten I’d happily scarf them down. Once we were back home in Ohio, I used to get crab legs anytime we went out for seafood. The waiters would generally offer me a kid’s menu to color on so that I could be like normal little kids and order something breaded and fried to oblivion, but I would have none of that. I wanted a pound of crab legs with a side of drawn better and a nice lemon wedge to squeeze all over everything. As a tiny kid, my dad showed me how to crack open the legs, claws, and body using the crab-cracker (I have no idea if it has an actual name so let’s just call it a crab-cracker). The best moments ever came when I snapped open a leg and pulled all the meat out whole. That’s when my dad would say “good one” and act like I was the most talented child to ever sit at a dinner table. Then I’d squeeze lemon onto it and dunk it in butter and gobble it up. I remember being in a grocery store in the middle of winter when I was about eight years old and seeing something calling “imitation crab” in the freezer. I begged my mom to let me get it and she kept telling me that I wouldn’t like imitation crab. But I had no idea what “imitation” meant. I figured it was just some sort of seafood word and she gave in and bought it. Now this is no slight on her cooking because I frequently tell her to open a restaurant and name it “Momma Food” (which is what my siblings and I refer to her cooking as), but the imitation crab was the worst thing I’ve ever eaten and should be outlawed. My hopes of having this new-fangled crab that came without the shell anytime I wanted were dashed. Thankfully, we still went out for crab legs from time to time and caught our own while on vacation, so I got my fix. What reminded me of this love affair with crab was my recent celebration of my sister’s birthday. We went out in downtown Charleston for some crab legs and when I pulled the meat out in one succulent piece she said “good one” and we cracked up laughing realizing that our dad had unknowingly programmed us to seek and offer praise during the whole crab leg eating process. We sent him a picture of our skilled crab cracking and he immediately called to let us know that we were doing a good job. Instantly we felt like little kids again down in Store Creek on summer vacation crabbing in the mud. It’s funny to me how so many of my memories can all be traced back to Edisto in some fashion. My love of crab legs is no exception. I love crab meat too. But so far haven't had much luck crabbing on Edisto. Any recommendations on where the best place is?